Tired of reading that yet today? The Chemin, also known as the Camino de Santiago, is a centuries-old pilgrim route that ends in Santiago de Compostela in northwest Spain. Every year, thousands of walkers—some devout, many not—follow the route that wends through quaint small villages and along busy highways alike, a journey unlike any other. Zoe, an artist from California who’s still reeling from her husband’s sudden death, has impulsively decided to walk the Camino, hoping to find solace and direction. Martin, an engineer from England, is road-testing a cart of his own design…and recovering from a messy divorce. They begin in the same French town, each uncertain of what the future holds. Zoe has anticipated the physical difficulties of her trek, but she is less prepared for other challenges, as strangers and circumstances force her to confront not just recent loss, but long-held beliefs. For Martin, the pilgrimage is a test of his skills and endurance but also, as he and Zoe grow closer, of his willingness to trust others—and himself—again. Can you imagine walking away from everything you know, everything you have, everyone you love in the name of finding yourself again? Yeah, me neither and yet that's what many do in some way (or completely) when they choose to walk the Camino. The reasons vary as much as the goal sought, but the outcome if given the proper time and attention is all about renewal. A new perspective on the important things in life, a new reason to wake each morning and greet the day with a hearty hello, a new way of living or even letting go...it's all about finding your inner peace, discovering your inner strengths, and allowing life to set you once again on the path meant for you. Zoe had a great heartache to walk for and from, but eventually she was able to come to terms with all that was wrapped up in that unexpected goodbye. Martin was seeking new fortune (with some fame), but ended up uncovering past wounds he never realized were still in need of healing. They BOTH learn how to depend on themselves, but also the strength shown in being able to open oneself up to another even after all the ugly has been bared...and yes, there is ugly to share, but there is also glorious hope, humor, and potential for happiness still to come. When I reached the end of my reading journey and while I wasn't ready to scale mountaintops to proclaim its wonder, I was pleasantly surprised. The paths the character's walked converged and diverged many times along the way, physically and emotionally, and while you can't hope initially for an attachment to form, by book's end it's easier to see it was never about the WE, but the HIM and HER rediscovering themselves; their connection or lack thereof was merely an addendum to which we were lucky to be privy to. 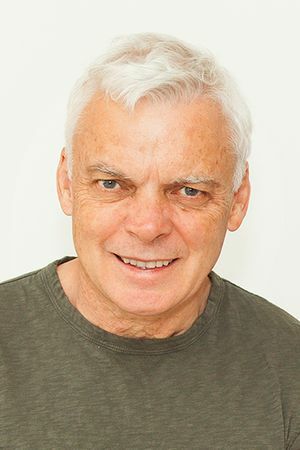 GRAEME SIMSION is the author of the #1 bestseller The Rosie Project, which has been optioned for film by Sony Pictures, was a Globe and Mail Best Book of the Year and won the Australian Book Industry Association Book of the Year. The Rosie Effect was also a #1 Globe and Mail bestseller, an instant New York Times bestseller and a Peoplemagazine Pick of the Week. Simsion’s most recent novel, The Best of Adam Sharp, has also been optioned for film. This is his first novel co-written with his wife, Anne Buist. Follow him on Twitter @GraemeSimsion. 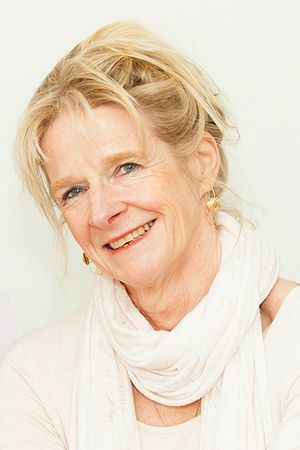 ANNE BUIST is the chair of the Centre for Women’s Mental Health at the University of Melbourne. She has over twenty-five years’ clinical and research experience in perinatal psychiatry, and works with protective services and the legal system in family cases. Her novels featuring forensic psychiatrist Natalie King are Medea’s Curse and Dangerous to Know. 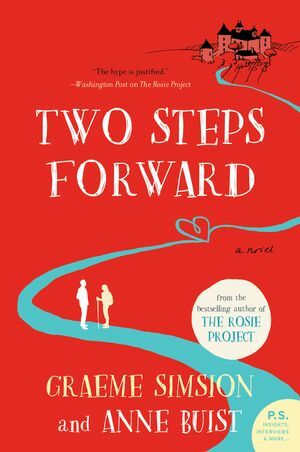 This is her first novel co-written with her husband, Graeme Simsion. Special thanks to Libby at HarperCollins Publishers for the copy for review. (THANKS!) For more information on this title, the authors, or the publisher, feel free to click through the links provided above. This title celebrated its BOOK BIRTHDAY earlier this month via Williams Morrow Paperbacks, so be on the lookout for it on a bookstore shelf or virtual retailer of your choosing. Graphic Novel Fan? Check Out the DARK TALES series from Canterbury Classics! My self-imposed BLOGAPALOOZA continues with POST #2...which is actually more like a FOUR IN ONE! Well sometimes things are best presented together for the overall effect and that certainly fits the situation here. A third glance at these titles, albeit only noticeable if you actually open them so consider me your virtual page turner there, reveals the story changes themselves. Now, don't get your pants in a bind...they didn't take liberties per se, though those they do are openly acknowledged and begged pardon for, but they may not completely be the tales you're familiar with. How so? Well,the opening to each (which was totally a BONUS!) reveals the history of the original story and how things have been changed or represented differently from the first publication. For example, did YOU know Belle apparently had SIBLINGS? Or that the Beast's curse was a tad different than simple vanity? Or how about that Maurice was actually WELCOME to the castle and created his own mess with a warned against blunder? Yeah...now you see what I'm getting at. The books take us through the story as it changed throughout history, and then allow us to indulge in this modernization with full color illustrations depicting the journeys along the way. Beauty and the Beast (978-1-68412-099-4) was certainly one of them. Though once again, I was surprised by the differences to the story as I remember it, this version was quite the read! I loved Belle's fierceness and determination, though she still retained her bookish nature and loving heart. I also enjoyed the curious nature of the castle in which they live (which was not simply filled with enchanted talking servants!) and the horrible evil that lived side by side in the shadows. ~shudders~ It was definitely different than the Disney versions many of us know, but equally memorable! The Snow Queen (978-1-68412-102-1) was next up on the favorite list. Though this was a tale I was only vaguely familiar with in its entirety, I was able to see so many other stories that were influenced by this original as I read. Gerda was one special girl and Kay was lucky to have her on his side because there are not many that would go through so much with so little promise of a happy end. Also, can I just say I really liked the reindeer? He was a bright spot for me despite the terrible circumstances in which he meets Gerda, and believe me with the evil start to the story along with the Queen herself, you REALLY needed a bright spot! The Hound of the Baskervilles ( 978-1-68412-100-7) would be third on the list....despite the fact that I was most familiar with this one (I even had a kiddie book version of it as a kid!). It might have been the familiarity that had it sink to third, but I think it was also the illustrations. While well penned and certainly depicting the scenes as they came, they just didn't sit as well with me. Cie la vie, the story IS just as amazing as it's always been though, so certainly no love lost there, and it makes a great way to introduce another generation to the story they may be reluctant to divulge in classic lit. The Call of Cthulhu (978-1-68412-101-4) unfortunately...didn't exactly make my list. I know, I know...fans of the author's work will probably want my head for this, but keep in mind, though I know OF his works, I've never READ his works, so my opinion on this story is purely from this version. Now, I had a coworker see I was reading it, got a little curious, and picked it up for a glance. According to them (they ARE a fan of the author's work), while it captured the basics of the story, and the artwork was interesting, it didn't really do the work justice on the whole. Hmm...might be a case of the book just simply doesn't translate well into this particular format...it happens, but in any case, it would still certainly serve the purpose of getting a reluctant reader interested in discovering MORE. As for this reader, maybe one day...just not today. Special thanks to Casey at Media Masters Publicity for the chance to read and share these new works with you as well as the copies for review. (THANKS!) For more information on these titles, the series, or Canterbury Classics other editions, feel free to click through the links provided above. The Dark Tales series is available now, so be on the lookout for it on a bookstore shelf or virtual retailer of your choosing. Have a PITCHIN' summer with AL CAPONE THROWS ME A CURVE by Gennifer Choldenko! It is no longer Thursday. This was my first exposure to Moose and all his friends, including those more infamous than others (seriously? The big AC? Not that I'm a fan, but gheesh...who doesn't know THAT name? ), and despite that fact, I rather enjoyed my stay on the island "no one escapes". 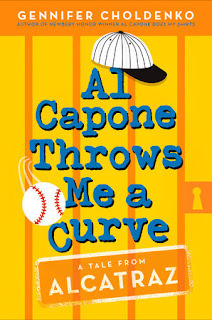 I knew of the Al Capone series from my bookstore days...kids would come in all the time asking for them, not to mention the visual appeal when straightening shelves (how can you NOT stop at a book with a title like Al Capone Does My Homework? )...and so when the opportunity to read and share this new one came along, I was definitely all in. I know, I know...it's a series and it's better to start at the beginning and while I fully intend to go back and visit the other installments one day, I'm here to say if you currently share the same boat as I, you'll wade through these waters just fine...bookmarks up to the author for making it so, too! Moose Flanagan...what is there to say about Moose Flanagan. He's not your typical hero, heck he's only a kid for crying out loud, and yet I gotta say, I can't help but see him that way. Despite how he could have been...self serving, greedy, uncaring, mean, and the list goes on...he was none of those things. True, he had his moments where he wished life was different, be it the locale in which they live, the acquaintances they keep, or even his very family, but those are simply human emotions...no one is perfect, nor is anyone's life perfect, and the fact that he figures that out while still taking on the weight of the world and never giving up the good fight is hero worthy in my eyes. But I digress...he is not the only one of note here to mention. We've got Natalie, his sister, who sees life differently and has her own challenges to face, including that of a mother who simply can't let go...yes, it's harder in her case for apparent reasons, but life still moves forward, people change, people grow, and while protection may be needed, that need changes shape. Then there's Piper, who I has a seriously had time trusting, you'll find out why, but is yet another case of people changing and growing, even if they still misstep along the way. Let us not forget Moose's parents (well meaning, but stretched thin), the warden (*grr*), the other kiddos in their group, and...the prisoners. Yes, that's right...I mean, they ARE on Alcatraz, so yeah, they are "residents" too...and some get a bit TOO close for comfort. Gennifer Choldenko was the youngest in a family of four kids, where her nickname was “Snot-Nose.” Her quirky sense of humor made its debut at the dinner table when Gennifer was a very little kid. She is the author of seven children’s books, including Notes from a Liar and Her Dog, a School Library Journal Best Book of the Year; If a Tree Falls at Lunch Period; and Al Capone Shines My Shoes. Special thanks to Josh at Random House Children's Books for the ARC for review. (THANKS!) For more information on this title, the author, the series, or the publisher, feel free to click through the links provided above. This title celebrated its BOOK BIRTHDAY earlier this month, so be on the lookout for it on a bookstore shelf or virtual retailer of your choosing.